MAMEM @ Researchers’ Night, inviting kids to play TETRIS using their eyes and mind! On Friday September 27th, MAMEM had the opportunity to be one of the main exhibitors in Thessaloniki’s Researchers’ Nigh. 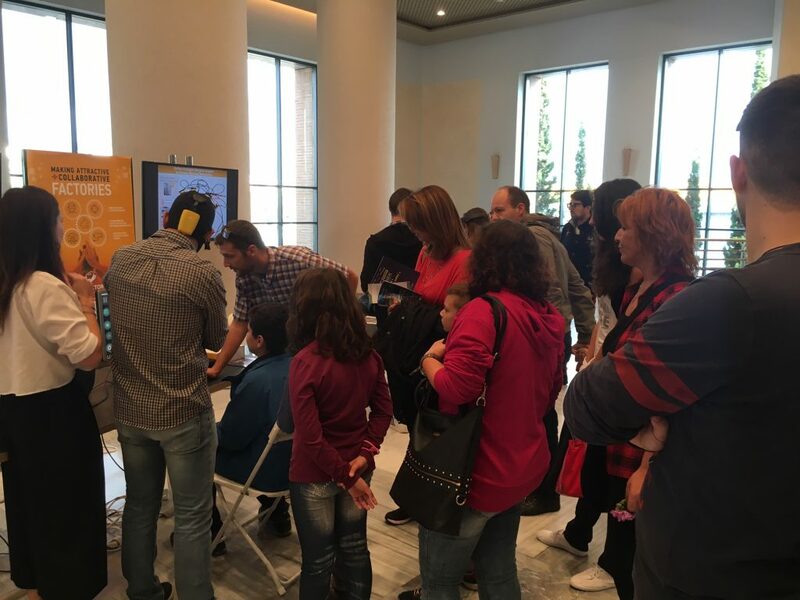 A crowd of kids with enthusiasm about science and technology flooded in Thessaloniki’s Concert Hall to meet and experience futuristic technologies and experienced researchers. MAMEM was there with one of the main exhibits inviting kids to play Tetris using their eyes and mind, as well as browsing the web with their eyes using GazeTheWeb. It was great to see the surprise in the face of kids (and also their parents) when explaining them that they could play Tetris with their eyes and even use their mind to rotate the tiles, if they agreed to wear the funny cup depicted in the picture. It was not a surprise to see the kids queuing-up for playing the game and get really excited when the succeed to clear-up a row. It was an exhausting day for Mklab-ITI crew, but full of energy and enthusiasm coming from our young visitors.